Today’s dish is not an earth-shattering, revolutionary recipe. It’s simply a wrap…but a really really delicious wrap! I was extremely disappointed that I didn’t get to make that pasta dish. But, it was time to get creative. I had bought some Tyson chicken strips to put in the pasta, so I wanted to use those. I also have some extra tortillas that need to be eaten. Thus, the chicken-ranch club wraps were born. They were reeeeeeaaaallly good. In fact, they were so good, I had another one for lunch today. So the next time you’re looking for something to make in a fix, or are just craving a delicious, fresh wrap, this is the way to go! Heat up the Chicken strips, either in the microwave or stove, according to package directions. Spread Ranch dressing over tortilla. Add cheese, lettuce, tomato, crumbled bacon, and chicken strips. Roll up. 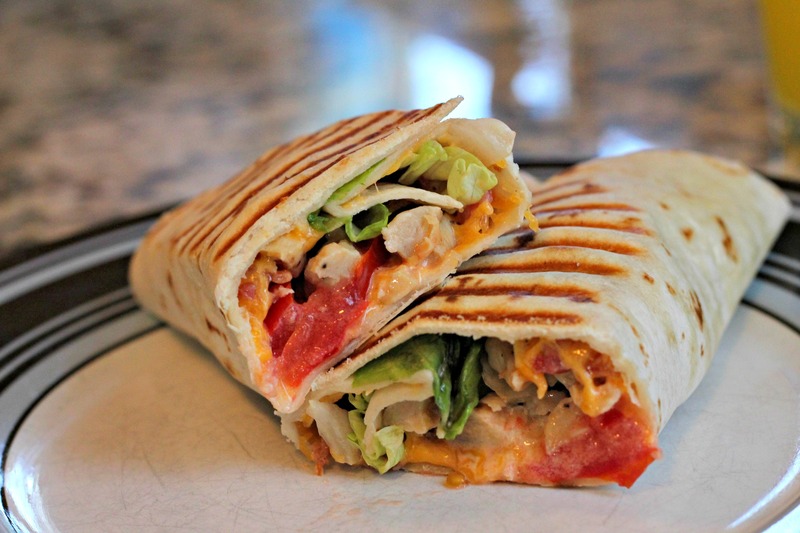 If you don't have a panini press, you could eat your wrap as-is and it would be great! If you DO have a panini press, I would recommend spraying your wrap with cooking spray and then letting it heat in the press for a couple minutes. This makes the wrap crispier and melts the cheese nicely. This looks great! I might have to try it. Thank you! My husband loves this!